The Post office is now offering a new service called informed delivery. USPS uses existing processes to gather digital images of the exterior of letter-sized mail-pieces that are processed through automation equipment. So, for example, I got this scan from them of the envelope of a Christmas card from my niece. They are also offering marketing campaigns to go along with the standard mail campaign, so an advertiser who sent you something, via regular mail, could add more information to the mail preview they send. So far I haven't received any of this. 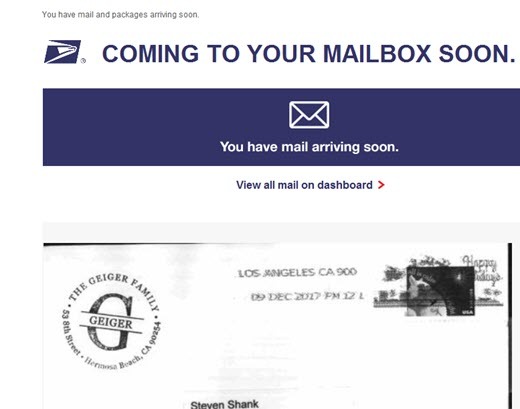 You also get a nice dashboard to track packages, buy stamps, pay for PO boxes and much more. In addition, since this is an online account offered by the government, I recommend getting yours before some miscreant gets yours and gets a notice of what mail you'll be getting when. This article is licensed under a Creative Commons Attribution-NoDerivs 3.0 Unported License.